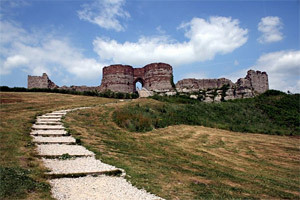 Destroyed by Parliamentarian forces after the Civil War, the castle's ruins stand dramatically on top of an isolated red-sandstone outcrop. Remains of the inner ward and gatehouse can still be seen and the deep dry-moat hewn out of the solid rock below. The site affords sweeping views across the Cheshire Plain and beyond. Displays and exhibits in the castle museum tell of the fortress's long and chequered past. Sandstone Gothic Castle built in 1801 set in landscaped gardens and a 500-acre deer park, with pleasant woodland walks and a rare breeds animal farm. The castle (not open to the public) is the private residence of the Marquess of Cholmondeley. Also on the estate is a 13th-c chapel (rebuilt in the 18th-c) containing 17th-c box pews, traditional family pews and a fine altar screen. Regular events held throughout the season. Restored Elizabethan corn mill, built of red-sandstone, with a large sweeping stone-tiled roof. The original mill machinery survives in full working order, driven by water from a 16th-c reservoir. It has two stepped water wheels, where water falling from the upper wheel, drives the lower wheel. Run by the National Trust. Visits by guided tour only. Ruins of medieval priory set in peaceful woodland gardens. The on-site museum tells the rich life story of the priory, discovered during extensive archaeological excavations. Preserved 18th-c cotton mill. Powered by both water and steam. Traditional spinning and weaving techniques demonstrated with hands-on exhibits and demonstrations. Picturesque valley setting by the River Bollin, with lovely woodland walks.